In the first Synod of Bishops held in Rome 1967, the topic of helping children participate in the liturgy became a priority. It was decided that children’s participation could be aided by shortening, omitting, or making a better selection of text which could be understood at a child’s level. With that in mind, the Congregation of Divine Worship prepared the Directory of Masses with Children as a supplement to the revised Roman Missal, published in 1969. On October 22, 1973, the Directory was approved, confirmed, and ordered to be made public by Pope Paul VI. This was one of the first documents issued by Vatican II. How are children dismissed for the Liturgy of the Word with Children? The priest calls the children forward, before the first reading, to listen to God’s word at an adapted Liturgy of the Word, blesses the leader and hands the Lectionary for Masses with Children to the leader, who processes with the children to a separate place (social hall). As the children are sent forth, the liturgical musicians lead the assembly in singing a suitable song. The children and leader exit down the main aisle, singing in procession until they reach the parish’s social hall to continue the Liturgy of the Word with Children. The Liturgy of the Word continues as usual for the main assembly. Children then return during the collection of the offering and participate with their parents and caregivers in the Liturgy of the Eucharist. CLOW is a part of the entire parish’s worship, not a separate “children’s time”. It is considered as an extension of the mass, itself. St. Mary’s Basilica utilizes Children Celebrate! 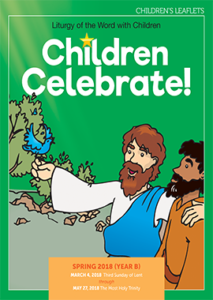 published by Pflaum Group Publishing to help us implement and deliver Liturgy of the Word with Children. The below link will give you a preview of a typical Sunday’s CLOW experience. The preview pages include the children’s take-home leaflet, leader’s guide and the Worship Order.